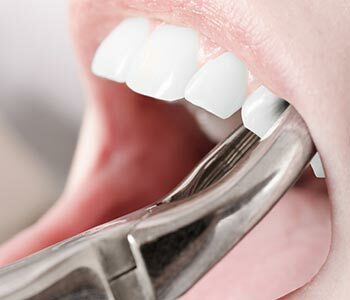 Our goal at Bingham-Lester Dentistry is to help patients throughout the Annapolis, Baltimore, greater Washington DC, Bowie, and Crofton areas keep their natural teeth for life. At times, though, tooth extraction in Gambrills is necessary or beneficial. In those instances, you can count on Dr. Vickii Bingham-Lester for technical precision with a soothing touch. Wisdom tooth removal in Gambrills – This is one of the most common types of extractions. These teeth, also called third molars, erupt much later than other teeth. Often, there is not sufficient room for them to develop, leading to crowding of other teeth and soft tissues. Decay – Untreated decay can compromise so much of the tooth that restoration is not possible. Failure to erupt – A stubborn baby tooth or wisdom tooth may refuse to emerge through the jawbone. Impaction can cause discomfort and impair normal oral development. Infection – An abscessed tooth can generally be restored with root canal therapy and a crown. However, extraction is an alternative. You can rely on prompt, gentle care from Dr. Vickii Bingham-Lester for extraction including wisdom tooth removal in Gambrills. Orthodontics – If your mouth is very crowded, it could be difficult or impossible to get teeth into proper alignment. A few carefully planned extractions may make straightening more efficient and effective. Periodontal Disease – Advanced gum disease eventually attacks soft tissues, ligaments, and bone that hold teeth securely. If treatment is neglected, loose teeth may have to be extracted. From standard extractions to wisdom tooth removal in Gambrills, Dr. Bingham-Lester uses gentle techniques. Once you are settled in the chair, local anesthetic is administered to ensure a comfortable experience. Sedation is also available. You can rely on prompt, gentle care from Dr. Vickii Bingham-Lester for extraction including wisdom tooth removal in Gambrills. Call 410-885-6522 to become a Bingham-Lester Dentistry patient. Wanda D "Everything about the office was wonderful! From the atmosphere and decor, dental hygienist, registration/office manager and of course Dr. Bingham-Lester herself. Everyone was professional and explained everything perfectly. Another extra was the television raised above your head in the examining room"